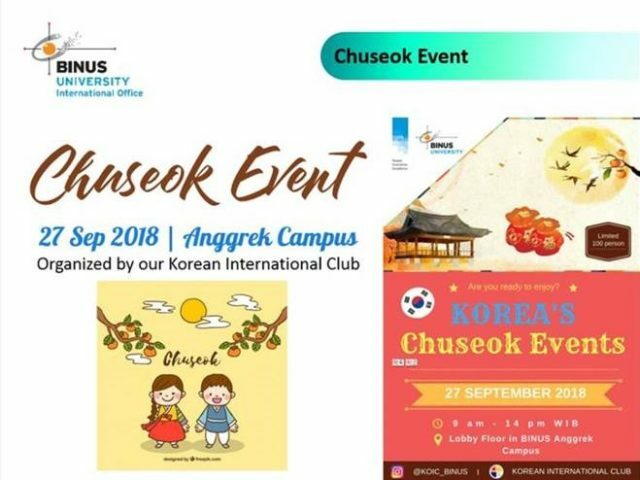 On 27th September 2018, BINUS UNIVERSITY hosted a Korean cultural event at its Anggrek campus in Jakarta. The event was organized by Mr Jeongseok Seo — an international student from South Korea currently studying at BINUS UNIVERSITY — and was themed ‘Chuseok’, which means ‘Autumn Eve’ in Korean and is a major harvest festival celebrated by both North and South Korea. During this period, Koreans would visit their ancestral homes to celebrate with their families as well as visit their ancestral graves. The event at BINUS UNIVERSITY featured traditional Korean games, music, a diverse selection of cuisines, and information on the Korean culture and the history of the region. Furthermore, students were taught the important diplomatic relations between Indonesia and South Korea as the country is one of the largest foreign investors in several Indonesian industries. This event highlights BINUS UNIVERSITY’s close collaboration with its South Korean counterparts with the institution already initiating partnerships with more than 20 South Korean Universities. These collaborations are focused on student and faculty exchange as well as research programs that are aimed to support wide-ranging solutions for a large variety of sectors in Indonesia.